For high quality, professional baking, a well-stocked commercial kitchen is an absolute necessity. Bakers need large quantities of a handful of ingredients in order to create everything from muffins and cupcakes to multi-tiered cakes and delicious cookies. If you have a bakery, or are starting a one, and you want to know which ingredients to have on hand at all times. Here is a list of the five necessary ingredients that every baker needs. 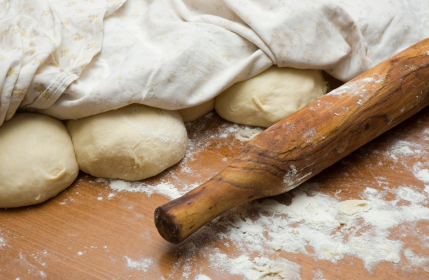 The first, and arguably the most important, ingredient to have on hand in a bakery is flour. Flour is made from milled, ground grain and it is the basic building block for all baked goods. Whether you are making light and fluffy biscuits, or dense, heavy pound cakes, you'll need to have flour on hand. There are different types of flour that are used for different tasks. Most flour is categorized by the type of grind or the fineness of the flour. Lighter, more heavily ground flours are used for delicacies such as angel food cakes or other fluffy baked goods. All-purpose flour is a standard flour that can be used to make a variety of baked goods. Whole grain flour is denser and coarser than regular flour, but many bakers prefer this flour for its health benefits and the absence of bleaching and enriching agents. Sugar is another important ingredient to have on hand. Bakers use a variety of different sugar types to sweeten baked goods and add delectable flavor. There are three basic types of sugar that every baker needs to have. One is white sugar which is the most common type of sugar. It is used in making sweet dough and batters for cookies, cakes, muffins, cupcakes, and other sweet baked goods. Brown sugar is a mixture of white sugar and molasses, and this sugar is used to create rich, flavorful dishes. Confectioner's sugar, often called powdered sugar, is white sugar that has been pulverized to a superfine texture. This sugar is used in a variety of baked goods, and is commonly used to make frostings and for dusting cakes and cookies. Eggs, like flour, are important in baking because they add structure and texture to baked goods. Eggs are often used as a binding agent. They hold a mixture together so that it doesn't crumble or fall apart after it is cooked. The best eggs are harvested from free range chickens that are fed an organic diet. These eggs are free of hormones and dangerous additives common to eggs harvested from chicken farms or factories. They are commonly available in farmers markets or from your local farmer. Butter is another crucial baking ingredient. The addition of this type of fat adds flavor and texture to your baked goods, and adding butter to a recipe can help preserve the life of your baked goods and keep them moist for a longer period of time. Salted butter and unsalted butter are both common types of butter used in baking. The final ingredient necessary for a professional bakery is some type of leavening agent such as yeast, baking poiwder or baking soda. Adding any of these ingredients to dough, according to your recipe, will instigate the release of gas during the baking process, which will lend a fluffy, light texture to breads, muffins, cakes and cookies and help them rise.